You are here: Home / Does Ecclesiastes 7:20, 29 teach Total Depravity? Several verses from Ecclesiastes are often used to defend the Calvinistic idea of total inability, but all they really teach is that all people sin. 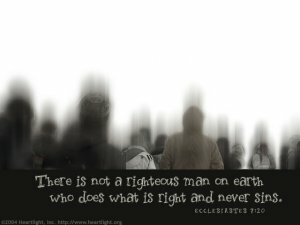 For there is not a just man on earth who does good And does not sin (Ecclesiastes 7:20). Truly, this only I have found: That God made man upright, But they have sought out many schemes (Ecclesiastes 7:29). This is an evil in all that is done under the sun: that one thing happens to all. Truly the hearts of the sons of men are full of evil; madness is in their hearts while they live, and after that they go to the dead (Ecclesiastes 9:3). In seeking to understand these verses, we must remember that the author of Ecclesiastes has a fairly pessimistic outlook on life, which is somewhat coloring his perspective on humanity. Nevertheless, this does not mean that what he says is not true. What he says is true: All people are sinners. Everybody sins. God has made us upright, but we seek out many schemes (Ecclesiastes 7:29). God made us inherently good, but each of us has turned away. We are sinful. 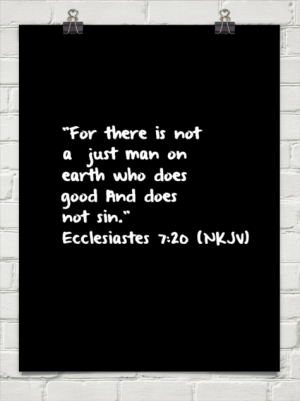 It could be argued, of course, that the statement in Ecclesiastes 7:20 says more than that people sin, for it also says that there “is not a just man on earth who does good.” In other words, not only do people sin, but all they do is sin. Many modern people would object to this idea, saying that most people perform all sorts of good deeds in their lives. I would argue, however, that even when we do good things, there are always hidden agendas and secret ambitions of the heart which lie behind the good things that we do. In doing good, we often seek to stroke our pride, have other people praise us, look good to our friends, or gain love, affection, and recognition from others. Sometimes we do good simply because it makes us feel good. So in this sense, we can agree with the statement in Ecclesiastes 7:20 that no one does good, for even the good things we do are tainted with ambition, pride, and selfish motivations. But nevertheless, this is still a far cry from the Calvinistic idea of total inability. Believing in Jesus for eternal life is not something we “do.” Faith is not a work. Believing in Jesus for eternal life is the opposite of work, and in fact, is founded upon the recognition that we cannot work for eternal life (Romans 4:4-5). Faith in Jesus is required because of the fact that “there is not a just man on earth who does good.” So passages like these in Ecclesiastes are not saying we cannot believe; they are simply saying that our works are not good. I fully agree with your post, Jeremy. I do not believe in total depravity of man, either. Actually, I think that our natural imprint is always fleshly and sinful as long as God has not yet opened our inner eyes so that we can discern what would be really good – in His sight. God’s view and standard is perfection, esp. perfection of love, which men cannot reach on their own, since, naturally we love our family members more than others, don’t we… Not like Jesus whose family merely consists of those who do the will of God (Mk 3:35) which is LOVE – again. Doesn’t that scripture hint at the possibility of “learning” to do good…? You and I are thinking along the same lines. I liked how you summed things up in that last paragraph. Thanks!